Frances Houghton excelled at British rowing's winter trials in Boston as Olympic pairs champions Helen Glover and Heather Stanning struggled. Houghton won the women's open single by eight seconds, with Glover finishing 10th and Stanning down in 22nd. Glover suffered a forearm injury midway through her effort, while Stanning was expected to be off the pace on her return to action after army duty. Olympic champion Alex Gregory and Matthew Tarrant won the men's pair. 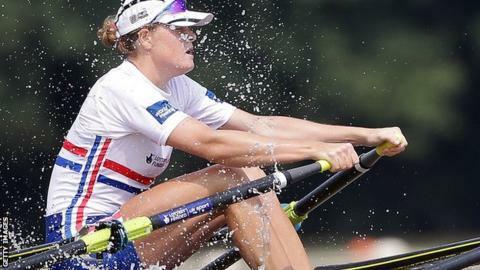 The trials see rowers compete over a gruelling 5km course - the Olympic distance is 2km - in singles or pairs, and are part of the process in determining the British squad for next year's World Cup regattas and World Championships. On a windy day in Lincolnshire, world and Olympic men's four champion Gregory and former world under-23 medallist Tarrant covered the 5km course in 18 minutes 2.46 seconds. "That final 3km was tough," said Gregory. "That was survival. The last 500m was very scrappy. It was really hard. I'd have liked it all to stop a kilometre before the finish really." Mo Sbihi and Scott Durant finished three seconds back, with Karl Hudspith and Constantine Louloudis in third place. Houghton is a four-time world champion and two-time Olympic silver medallist, and she won Saturday's open single in 20:58.78. The 33-year-old finished comfortably ahead of Beth Rodford and Vicky Thornley, and said: "At the end I had zero left. I have been working really, really hard and to see my name at the top of the results sheet is fantastic." Glover battled through to finish 10th in 21:44.84, while Stanning was considerably further back. Stanning had only recently returned to training after serving in Afghanistan following last year's Olympic Games, leaving Glover to team up with Polly Swann and win the world title in August. Alan Campbell narrowly managed to turn around edging to victory by 0.2secs, while in the lightweight categories Pete Chambers and Imogen Walsh won the men's and women's singles. "I was pretty surprised with that," said Campbell. "I didn't expect it especially as Charles went off first. I am very pleased with that."